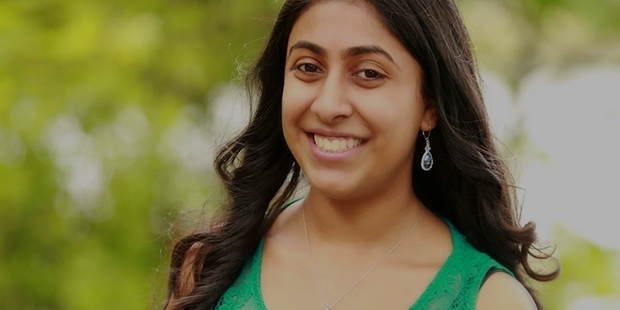 Deepika Kurup is the inventor of an inexpensive process that purifies water using sunlight and a Photo catalytic composite; she has won Discovery Education 3M Young Scientist Award in 2012 and U.S. Stockholm Junior Water Prize for invention in 2014. Her purifying method can be a potential game changer in providing clean drinking water, especially in the underdeveloped countries. Deepika was born on April 12, 1998 in Nashua, New Hampshire to Pradeep Kurup and Meena Kurup. Her family moved to USA in 1983. 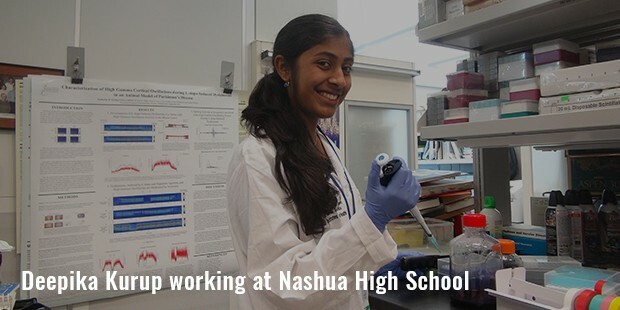 She is presently studying at the Nashua High School. 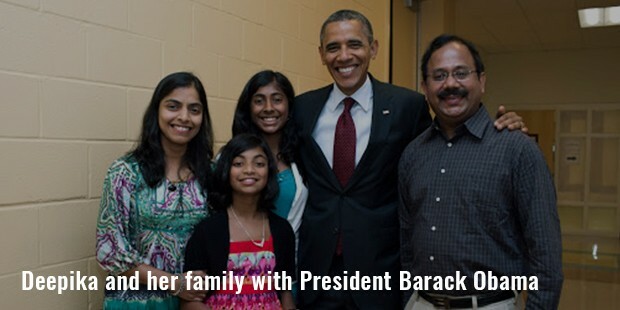 Her father is a professor of Civil Engineering at the University of Massachusetts Lowell. Deepika has won the Discovery Education 3M Young Scientist in 2012; she used titanium dioxide and zinc oxide, a photocatalytic composite that under the sunlight purifies water. The inspiration for this idea came when she witnessed children drinking dirty water from a stagnant pool during her visit to India. She developed an improvised photocatalytic composite by using sand, TiO2, Portland cement and silver nitrate after three years. This composite worked efficiently and reduced 98% of coliform bacteria after filtration. When exposed to sunlight the photocatalytic composite inactivated 100% of coliform bacteria from the sample water. 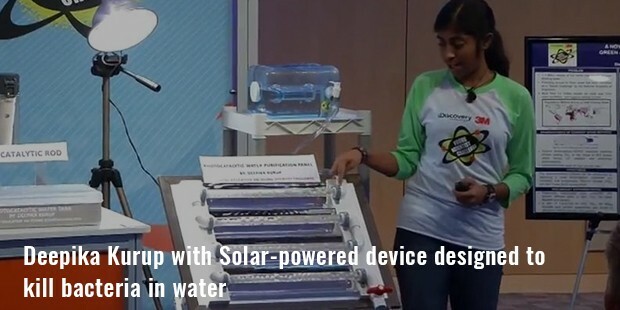 She won 2014 United States Stockholm Junior Water Prize, for this invention of hers. 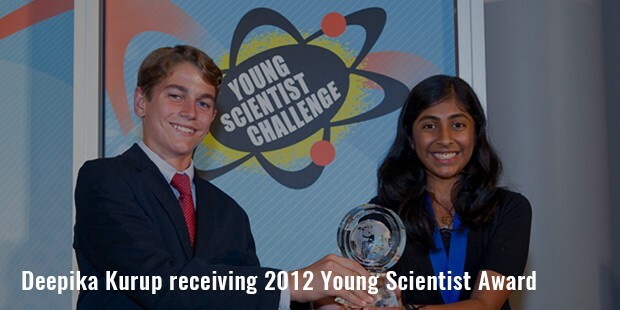 Kurup's initial idea that won her the Discovery Education 3M Young Scientist in 2012 is based on using a photocatalytic compound for water purification. This project involved a photocatalytic composite made up of titanium dioxide and zinc oxide, hollow glass microspheres, and Portland cement. In 2012 Kurup's photocatalytic composite was able to reduce the amount of total coliform from 8000 colony-forming units to 50. In addition, it oxidised Methylene blue at a faster rate than standard solar disinfection methods. How Have E-Sport Attracted A New Passion?